Come Downtown Naperville for the Holiday Parade of Lights! Little Friends: Holiday Parade of Lights! ✴1:00-4:00pm: Free Holly Trolley rides around the downtown sponsored by the Main Street Promenade shops! Hop on board at one of 6 drop off and pick up locations including the Main Street Promenade, the northern entrance of Nichols Library, Jackson & Eagle, Chicago Avenue near Sugar Monkey Cupcakes, Chicago & Washington (near Barnes and Noble), and the south entrance of the Van Buren Parking Deck. Ding! Ding! ✴3:45-4:30pm: Area high school superstars will warm up the crowd from the parade main stage (at Main & Van Buren – NEW location!) with holiday tunes including: Jenna Davies (Metea) Deanna Wisniewski (Neuqua), Colton Pouncy (Waubonsie), Hannah Lorimer (Naperville Central) and Alex Benoit (Naperville North). Come support your school! ✴4-6pm: Enjoy complimentary hot chocolate at the Main Street Promenade, courtesy of the Main Street Promenade and Naperville Dental Specialists! ✴4:30pm: Little Friends Parade of Lights begins! Join parade Emcee Scott Mackay from 95.9FM the River, along with Katie Wood from the Downtown Naperville Alliance and Kathleen Malecki from Little Friends at the main stage (Main & Van Buren). The parade will step off from Water Street, head north on Main Street, west on Van Buren and end at Eagle Street, near Naper School. This is a night not to be missed! ✴5:15pm: Our local high school superstars and Show Choirs from the School of Performing Arts will hit the stage singing holiday favorites for the crowd while we prepare for Santa and Mrs. Claus to return to the main stage and sing with us! ✴5:45-8:00pm: Santa and Mrs. Claus will visit with children at the Santa House, with a special preview opening tonight! Located at Jackson and Webster near the Riverwalk Holiday tree, children can enjoy a first of the season visit! ✴5:45-9:00pm: Most shops and restaurants will be open – Make your post parade dinner reservations early! See the Painted Snowman on display around the downtown which will remain up until mid-January. Vote for your favorite snowman online at www.downtownnaperville.com. Shop, Dine & Be Merry the entire holiday season DOWNTOWN! Your daily stress level may be affecting your potential for gains made in the gym. Cortisol, known as the stress hormone, is one of the body’s instinctual response hormones to the fight or flight situation. It’s released by the adrenal gland during times of stress and has several functions in the body, such as blood pressure regulation, glucose mobilization, and reducing inflammation. Although beneficial and even crucial in many aspects, chronically increased levels of cortisol will impede your body’s overall health. It’s one of the hormones responsible for tearing down muscle tissue, and also increases fat stores, particularly in the abdominal area. One way to keep this destructive hormone lowered is to avoid stressful situations as much as possible. Another way to lower cortisol levels is via a proper, well-balanced diet with the right nutrients. Wild Alaskan salmon – Studies reveal that subjects taking fish oil for as little as three weeks experience lower cortisol levels compared to subjects receiving a placebo. Wild Alaskan salmon is one of the premium choices for omega-3s. Other foods high in omega-3 fatty acids include halibut, walnuts, almonds, and flax seed oil. Oranges – Increasing your intake of vitamin C, which is found in citrus fruits such as oranges, as well as bell peppers and dark green leafy vegetables, could reduce cortisol levels. A research study at the University of Alabama concluded that rats given vitamin C supplementation had reduced levels of cortisol after a stressful event compared to those receiving a placebo. Low glycemic foods – Low glycemic foods can lower cortisol levels in your body. It’s recommended to take foods such as eggs, meat, poultry, fish, and vegetables to lower the cortisol level. High glycemic index foods containing large amounts of sugar or starch are poor choices for reducing this hormone level, and may even increase the level of cortisol in the blood. High glycemic index foods need utilization of almost an equivalent mass of animal protein to keep glycemic balance. It’s also necessary to avoid extreme low calorie diets. Low calorie dieting is a major stress to the body and increases cortisol production while simultaneously declining testosterone levels. Dark chocolate – Good news, chocolate lovers. Eating dark chocolate may aid in relieving stress. Researchers in Switzerland examined the effects of dark chocolate on stress metabolism. At the end of a two-week study, scientists observed that the group that was given 40 grams of dark chocolate per day experienced decreases in cortisol levels in the blood compared to the control group. In addition to the above foods that may lower cortisol levels, the adequate amount of sleep (seven to nine hours of sleep per 24-hour span) and a regular exercise regimen are crucial in lowering the levels of the stress hormone. Additionally, rose hip extract – a mineral – has been found to reduce cortisol levels and reduce stress. You can find rose hip extract at your nearby health food store. Rose hip extract may also help fight the flu and colds. “Fish oil prevents the adrenal activation elicited by mental stress in healthy men,” Diabetes & Metabolism, 2003. “Scientists say vitamin C may alleviate the body’s response to stress,” Science Daily, 1999. “Effect of Glycaemic index of the diet on salivary cortisol and testosterone levels in females,” Society for Endocrinology, 2007. (NaturalNews) Whooping cough (pertussis) has reached epidemic levels in the U.S. — the highest in five decades. Considering a majority of those who contract the disease are vaccinated, the absurdity of the call for increased pertussis vaccinations by the Centers for Disease Control and Prevention (CDC) is yet another example of our broken medical system. Even more disturbing, scientists now suspect that vaccines are actually causing this upsurge in whooping cough — contributing to mutations of the original bacterium into more virulent forms. Whooping cough is an extremely contagious disease of the lung that can be contracted at any age, but is especially dangerous for children. It begins with congestion similar to a cold, lasting up to 10 days. A severe cough then sets in with a ‘whooping’ sound accompanying the intake of breath. Recovery can take several months, depending on the constitution of the individual. Babies and small children have the highest death rate due to complications that arise from the disease. 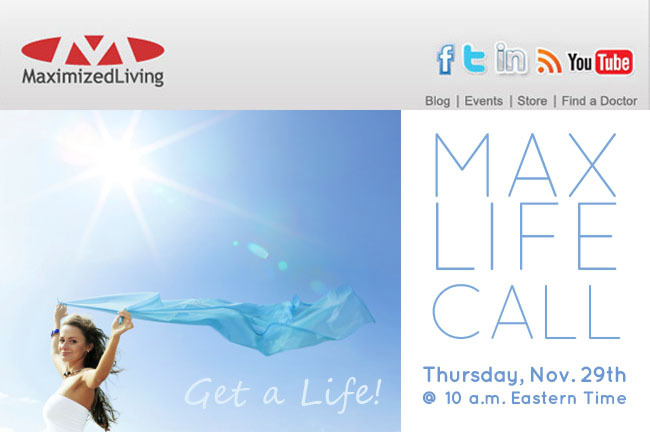 Maximized Living Seminar: Increase Production & Lower Stress in Your Day! Everyone is busy. Between work, home life, kids, school and more, it’s easy to feel like you’re always running behind. The holiday season is certainly no exception. Luckily, this doesn’t have to be the case. You can be more productive, more supportive and more reliable. On this MaxLife Call, learn how to accomplish twice as much in the same amount of time. Keep your family happy while continuing to build the life of your dreams! This call is free and open to the public. It will be hosted by Dr. Greg Loman. We will be collecting toys in our office through December 10th. Thank you in advance for supporting the children of our future! Dr. Jessica J. Scherer, D.C.
End of Year Benefits Running Out! The end of the year is when most flexible spending, health savings, and insurance benefits expire and we’d like to give you a friendly reminder that it’s a good time to come in for your chiropractic visit. Request an appointment by calling our office before the end of the year to take advantage of your insurance benefits. Call us today at 630-357-2299 and we will get you scheduled!